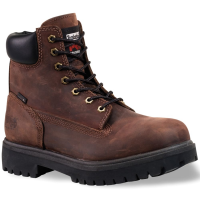 The Timberland PRO(R) 6-Inch Waterproof Insulated Steel Toe work boot has a slip-resistant non-marking rubber outsole plus 200 grams of insulation for cold weather comfort. Premium waterproof leather is sealed at the seams to keep feet reliably dry. Insulated (200 grams) to keep feet warm in mild winter weather. 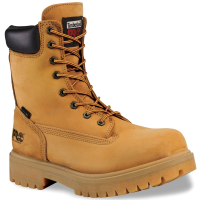 Timberland PRO(R) Rubber outsole for reliable slip-, oil-, and abrasion-resistance. Electrical hazard protection meets ANSI Z41PT99, ASTM F2412-11, ASTM 2413-11 and F2892-11 standards to provide protection from open circuits. 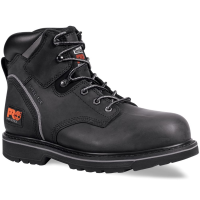 Steel toe meets safety standards and is engineered with a wide-flanged, tempered steel toe cap. Lightweight PVC midsole for cushioning. Molded nylon shank and shock diffusion plate provides sturdy support and tortional rigidity. Footbed and lining treated with antimicrobial Agion(R) for odor control. Padded ankle collar creates a comfortable fit and keep out debris.